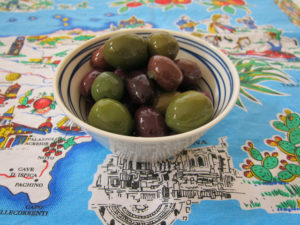 I love olives and have been making variations of this recipe for decades. They taste great on their own as a snack, and can be used in salads and other savoury dishes. A jar of marinated olives also makes a delightful gift. Note: It’s important to sterilize your glass jars and lids well and use good quality ingredients, especially fresh olive oil. If the olives are in brine, drain well. 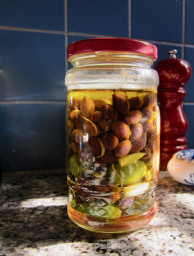 Pack olives and herbs in a sterilized jar and pour over olive oil until covered. Store in a cool, dark place for at least a week to infuse the flavours. When stored well (in the fridge or other cool, dark place) and the olives remain covered in oil, they’ll last for months. Left over oil can be used in salad dressings and cooking. This recipe is vegan and gluten-free. For more healthy recipes check out the resources section and sign up for the free monthly newsletter.